Welcome to PRASM: Got Color?! PRASM's Unisex D-Ring Adjustable Canvas Belts are the best way to up the ante on your casual, everyday attire without committing "fashion overkill," as the saying goes! With PRASM's hot designer label belts, you don't have to spend hours in your wardrobe searching for a look that will turn heads or make you stand out. Just choose a PRASM color-style belt to put with your simple, everyday styles and like that you have a somewhat abstract look that takes your casual attire to the "fashion forward" level! While you're at it why not add a bit of "color-style" wrist flair for your daily workout routines?! The PRASM Water-Resistant Zipper-Pocket Wristbands are a perfect accessory for all your sports and athletic activities. Our PRASM Zipper-Pocket Wristbands can easily hold your keys, loose change and paper money, or any other small items you take during your fitness routines. PRASM Zipper-Pocket Wristbands are made of the highest quality Ring Spun Absorbent Cotton Blend with an elastic band for comfort, fit, and superb shape retention. Our patented Water-Resistant Zipper-Pocket Liner is designed to protect your valuables from getting wet from sweat and the elements during your activity. Not a person who is very active? No problem! 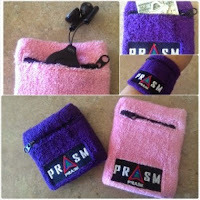 PRASM's Zipper-Pocket ColorStyle Wristbands are also perfect for straight styling it up. Get your wrist flair popping by adding a touch of color-style arm candy! These wristbands are another great way to express yourself through color. To buy PRASM belts, wristbands, and other accessories, please visit our online store at www.PRASMCLOTHING.com or find us on eBay and Amazon! Cheers, and thanks for stopping by for a read!